i recently tried making some sidewalk chalk paint after seeing the recipes on a couple of sites... check them out on ohdeedoh and kiddio... and fell in love! 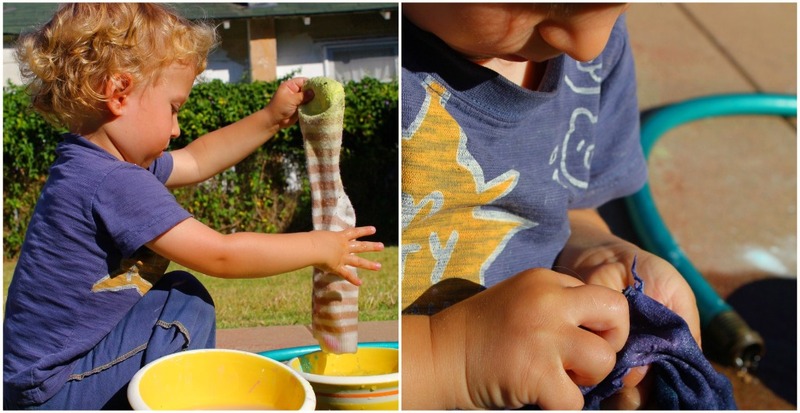 with just the right mixture, it's such a neat activity to do outside... vibrant, messy, easy to clean up, and oh, so satisfying to paint with (i think more for me than leo). 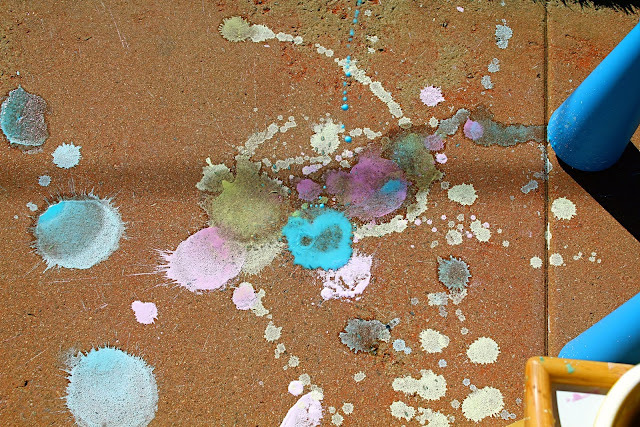 with all the talk of fireworks coming up, we decided to mix some up again, and combine it with an activity i used to do in the classroom each year (in the classroom, we'd use regular paint, and do it on paper instead of on the sidewalk). add equal parts of water to cornstarch... and then add a little extra water. all the recipes have called for equal parts when using it to paint with, but for this activity, it needs to be a little extra watery for the splash effect. we used two tablespoons of cornstarch and added roughly three tablespoons of water. then, grab the old socks, and fill them with a few scoops of filling. i often struggle with using food products in projects, so i decided to use some extra fish gravel we had, which could just be washed off and reused when we were finished. (of course, ask the fish first if it's okay). once you've got a good ball of filling at the bottom, tie off the top of the socks. hold it up nice and high, and let it go! when it hits the ground, it should make a nice SPLAT!, and create some great looking sidewalk fireworks! (leo gave his a little spin before the drop... which made some cool drips and smaller fireworks). repeat, repeat, and repeat for more! when we were finished, we still had so much more to do. i love including leo in the cleaning process, especially when it doesn't even seem like cleaning. and rinsed out the socks. ooooh... interesting! i've never done fizzy sidewalk paint before! we'll have to give that a try! Hmmm, I'm planning to go to a friends tomorrow to do fizzy sidewalk paint, where you add baking soda to the paint and then spray it with vinegar. This might be a fun twist for the boys . . .